Selling is to business, what oxygen is to human beings. A business cannot survive without sales. The pressure to sell is immense in the raging competition of the online age. Any avenue to augment sales for a business is more than welcome. A lot of businesses are winning customers with websites now. A website is a great medium to attract global customers. It is a powerful selling tool. And businesses which are able to tap into the online world and internet are growing quickly. Selling effectively on internet is no longer optional for enterprises; it is fast becoming the norm for competitive advantage & growth. 1. Simplicity: How would the customer search your product or service? What keywords and topics are people likely to search to find you? A good website answers these questions with simplicity. The portals that generate effective leads are those developed with the consumers in mind. Don’t bombard user with too many options. It creates choice paralysis, where users cannot decide what to opt for. 2. Address these questions for your customers: What problem are you solving for the customers? Who are you? Where are you located? Why your product or service is better? When is the customer going to benefit from your product or service? How are you going to serve the customer pre & post sales? A website that converts online visitors into paying customers addresses these concerns. 3. Sales Objections: Address the sales objections faced by your team. Whether the questions are related to support, service or pricing, you must proactively take care of those issues. Feedback from sales team is important in addressing the concerns of the prospects. 4. Describe the product or Service: A product or service is delivered to serve the customer and resolve his pain points. The details of the product/service should highlight the benefits for a customer, after sales support etc. 5. Make the pricing simple & transparent: To facilitate online sales, simple pricing is always helpful. When the customers can see how the products & services are charged, they are more likely to make the purchase. The visitors may also want to see comparison of pricing for similar products/services online. Make all the relevant details available. Make it easy to talk to People whether it is customer service representatives, support or product specialists. The customer feels much more confident to go in for the purchase once he interacts with a human. 6. Communicate your position in the marketplace: Great brands are able to establish their credibility with the visitors. They make an impression on the visitor by highlighting their track record, service offerings and position in the marketplace. 7. What Your Customers say about You & How You Serve them After Sales: Customer testimonials and references are very important in building a rapport with the visitors. The trust factor is critical for online sales. When visitors see credible references on the website, they are more likely to make a purchase. 8. The buying Process including refunds: The buying process should be very simple and efficient. The refund process should be even simpler. It should be very easy for customers who don’t like your product/service to get a refund. Top business websites provide money back guarantee and easy refunds to lure their customers. 9. Provide Free Trial of your product or Service: To sell effectively on the web, winning the trust of the visitor is important. A free run of the product/service is a great way to woo the customer. If your product can serve the customer, there is a great chance of conversion. If it is not possible to give a free trial, then giving something valuable like an ebook, video content and other information will create a loyal visitor base & leads. 10. Consistent Experience: The penetration of mobile visitors on the web is not a secret anymore. The users expect a consistent experience irrespective of the device they are working on. It is a must have feature for a business website to cater to mobile users. All features and functionalities should work seamlessly for mobile & tablet users. A mobile friendly website creates a consistent brand identity and increases chances of sales. The internet is practically the biggest medium to attract customers for a business in today’s world. Consumers are going digital and businesses are trying their best to engage them. 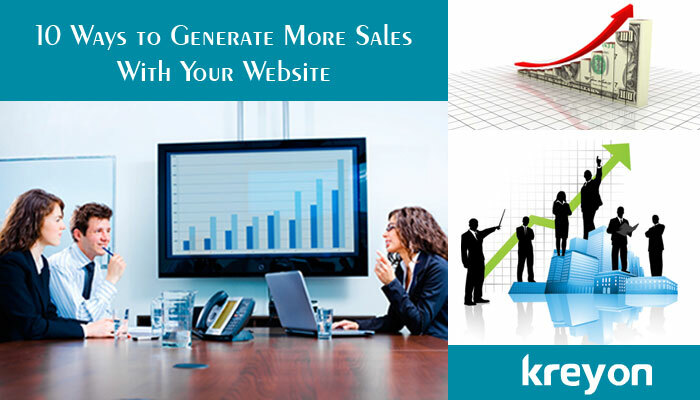 A website acts as a great sales tool attracting leads around the globe. It helps to connect with the potential customers. A top corporate website is paramount to create an online brand presence, showcase offerings to global consumers and also generate sales.